Here you have the new releases for this month, the evil Dr. Moriarty and the elusive Kelly Kraken !! The can get them here. Soon we will upload the painting processes. Remember that if you have any questions, do not hesitate to ask! Welcome to the Smog Riders world! Welcome to the Smog Riders blog. Are you ready to level up your painting level? Come in and learn! What I can find on this blog? In this blog you’ll have the tutorials that go with the Smog Riders figures so you can see them in a larger size to better appreciate the process. In addition, some figures will have additional processes of greater difficulty that we call Level Ups! Each figure will have two sections, one where the basic processes are grouped and another one with the Level Ups! 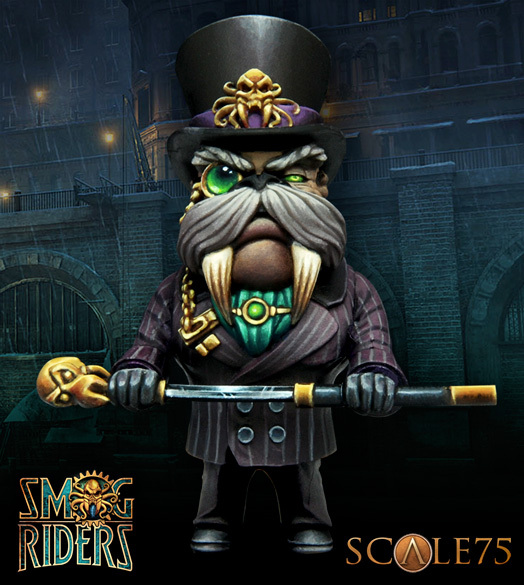 As we’ve already mentioned Smog Riders is focused on helping you to increase your painting level and therefore the communication is very important. One of the advantages of the blog format is the possibility that you can add comments and questions about the processes. With all your questions we can go completing the original information to achieve tutorials that satisfy all the visitors and can that can always bring a little more with each new visitor. By separating the comments of the basic section and the Level Ups! it will be easier to guide the answers to a level that can be understood by all visitors and to follow easier the thread of the conversation. We understand that although many questions will be the same it is better to not confuse those beginners with complex questions and answers that may be out of their reach at that moment. Are you ready? Start your journey! Here are links to the first four miniatures in the series.